This is pretty much the same thing, only it puts a little more blame on the Democrats and offers an implied prescription for the direction of the Party. All of these explanations are fairly similar. In an increasingly rare event in politics, all sides are in agreement on the basic facts; that Trump won, that Clinton lost, and that the Midwestern states were the reason why. They are all describing the same event, and so arrive at a set of explanations that satisfactorily summarize the same results in a way that suits their respective worldviews. Each explanation seems plausible. Which one to use depends on the target audience, but any one of them could work in a typical piece of political analysis. But chances are, you don’t want typical political analysis. If you did, you would be reading CNN or Fox News or Huffington Post or Breitbart or some other site. You’re here because you want more than a summary. You want to understand 2016 in a larger historical context, and to know about the economic, cultural and philosophical forces underpinning the shocking electoral result. In other words, you want to know what really happened. In February 2016, in a desperate attempt to save his failing campaign, Senator Marco Rubio tried to beat Donald Trump at his own game. He decided to attack Trump just like Trump attacked all his opponents. He went low. He launched all sorts of Trump-esque juvenile insults. He tried to out-Trump Trump. He failed. On March 15, 2016, he lost the Florida primary to Trump, and ended his campaign. Why did Rubio fail? If the insult-comedy routine worked so well for Trump, why didn’t it work for Rubio? After all, if willingness to be shocking was all Trump had going for him, surely Rubio should have neutralized that by being shocking right back at him. One theory would be that Rubio seemed disingenuous. He hadn’t been rude or aggressive for most of the campaign, and so it was obviously a calculated move on his part. According to this theory, Rubio’s plan backfired because it reinforced the idea that he was a professional politician who altered his own personality to serve the needs of his campaign. Trump, on the other hand, seemed like he was the same guy the whole time. This is a reasonable interpretation, but the “Trump is consistent” aspect only goes so far. For example, it ignores how Trump could claim to respect Dr. Ben Carson only a few months after attacking him viciously–calling him, among other things, a pathological liar. This suggests that consistency wasn’t the source of his strength after all. The thing that allowed Trump to get away with that kind of reversal when Rubio could not was charisma. Trump’s charisma made his supporters love him regardless of anything he said or did. Rubio enjoyed no such benefit. Not a bad definition, but too general. It would be more helpful to define what the “certain quality” is. A key component of it is confidence. The charismatic person is confident, and so their audience absorbs that confidence, and begins to believe in the charismatic person as much as they believe in themselves. In the case of Trump and Rubio, this meant that Trump always seemed to have total confidence in whatever he was saying at any given time, whereas Rubio always seemed slightly hesitant–like he never fully bought into what he himself was selling. Large crowds have a psychology all their own. It is a mindset that is very different than the individuals who make up the crowd. And this crowd-mind can sense weakness or lack of resolve, and they were sensing that from Rubio. Trump, with his total self-assurance, projected no such weakness. Trump is a master of manipulating crowd psychology. It’s why his rallies are so wild and get so much attention–it’s like he is conducting the symphony of the mob around him. This is why Trump, despite having no political credentials, defeated not just Rubio but all of his more experienced opponents. His charisma was what gave him the advantage. This is a fairly satisfactory explanation of the election, but there is still a problem: if Trump was so charismatic, why did he lose the popular vote? Logically, you would expect charisma to translate into high popularity, but obviously this did not happen. Charisma is useful for persuading people, not winning complicated systems of votes apportioned according to arbitrary rules. If anything, charismatic candidates like Trump should be more likely to win the popular vote and lose the Electoral College. First of all, it’s important to understand the limits of charisma. While it is very powerful and can at times seem almost “indistinguishable from magic”, it clearly does not work on everyone. If it did, the charismatic candidate would win 100% of the vote in every election. Some people did not think Trump was charismatic–indeed, they found the very sight of him repulsive. Other people, including me, saw that he was charismatic, but opposed him anyway because of disagreements on policy, moral objections and/or opposition to the Republican agenda in general. Charisma is at least partly subjective, and even the most charismatic people in history never had a 100% success rate at appealing to the people. There are always non-believers who are not enthralled, and find the charismatic person’s popularity inexplicable. In this respect, evaluating charisma is a bit like discussing a work of art. There may be broad consensus on what is and is not “good art”, but there can never be universal agreement because it is partially a matter of individual perception, and perception is shaped by a person’s life experience and circumstances. The same is true of charisma. This is the key to the success of Trump’s electoral strategy. His charisma resonated most with middle- and low-income white voters in the Midwestern states. These voters are the so-called “Reagan Democrats” who don’t necessarily support the establishment Republican agenda of tax cuts and free trade, but who feel culturally opposed to the urban, cosmopolitan Democrats. 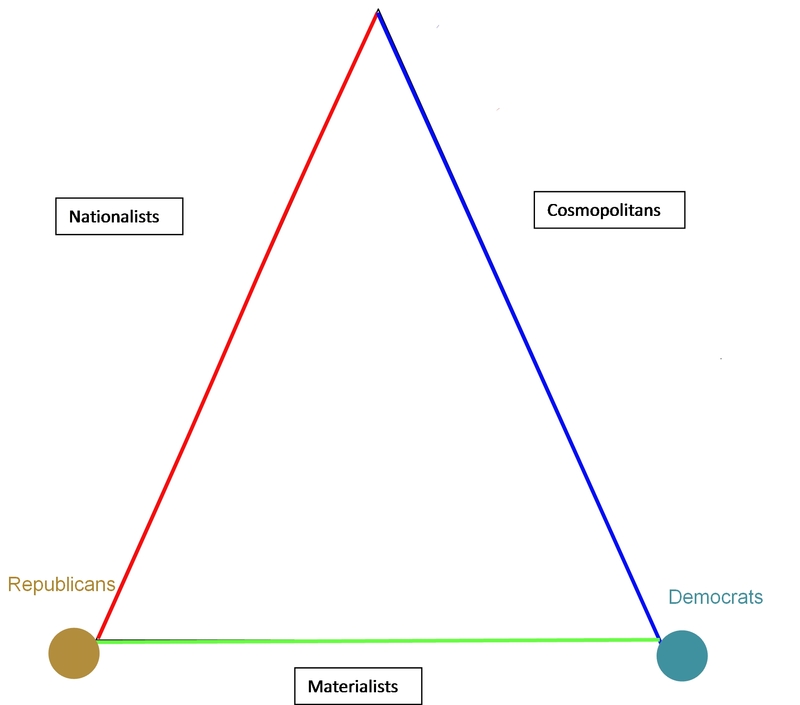 To use my unorthodox political framework, these are what I call the “nationalist” voters, and they united behind Trump as he defeated first the materialist Republican establishment and then the cosmopolitan Democrats. Kellyanne Conway is fond of bragging about how Trump spent lots of time visiting Midwestern states like Wisconsin and Michigan–states that Clinton believed “safe” and therefore in which she spent little time campaigning. And indeed, this was the key to Trump’s victory. He concentrated his charisma in states with many electoral votes and high numbers of nationalist voters. This maximized the electoral payoff he got from his charisma advantage. I admit, while I am very sad that it worked, as a piece of strategy it is absolutely brilliant. He not only applied his charisma in the states where it would have maximum resonance, but that also yielded the highest electoral college rewards. He stacked one “force multiplier” on top of another, as it were. Of course, Trump was also very, very lucky that he even had states like this to work with. Minor differences in the demographic compositions of a few states could have easily changed the outcome of the election. Trump had to have a very clever strategy, and then have lots of things go in his favor on top of that, just to eke out a narrow Electoral College victory. That’s a pretty simple answer, in my opinion; although Lord knows it took us enough work to arrive at it. Shouldn’t the answer be the same as above? Well, if you take the view that Clinton did everything possible to win, and that Fate simply dealt Trump a better hand, then yes, it would be. But if you believe in Free Will and/or Cause and Effect, it’s worth evaluating what happened so you have some ideas for what will happen if you see a similar situation again. As I said at the beginning, plenty of people have their theories on what the Democrats could have done differently. The “progressive” or “liberal” wing of the Democratic Party thinks they should have nominated Bernie Sanders. They point to Sanders’s surprise victory over Clinton in the Michigan primary as evidence of his superior strength in the Midwest. One obvious problem with this idea is the fact that Sanders lost to Clinton, which makes it tough to argue he could have defeated someone who defeated Clinton. But the Sanders supporters have an answer: the Democratic National Committee rigged the primary in favor of Clinton, incorrectly believing she had the best chance of winning. In some ways, this makes sense: Clinton was the preferred candidate of the Democratic upper-management, and in retrospect, it is inarguable that they vastly overestimated her chance of winning. The means of rigging the primary, according to the Sanders supporters, was the Democratic “superdelegates”–unpledged Party officials who are not bound by any state vote. As Democratic insiders, they supported Clinton by a significant margin. The Sanders wing argues that they exist to ensure victory for the preferred candidate of the Party leadership. This is not always true, as Barack Obama demonstrated in 2008 when Clinton was also the establishment favorite. Obama ultimately persuaded superdelegates to switch from supporting Clinton to supporting him. Looking at this, it’s easy to see why the Democrats decided they needed to prevent this kind of disaster. Hence the need for superdelegates to prevent the party from nominating someone who could not win a general election. Viewed in this context, Sanders looks like exactly the sort of candidate superdelegates were created to thwart: popular among the notoriously unreliable young voters, with many policies outside of cultural mainstream. So, perhaps the superdelegates did their job, but in so doing cost the Democrats their chance at winning. But did Sanders really have policy positions that would make a meaningful impact on the Midwestern nationalist vote? Contempt for trade agreements like NAFTA is about the only thing Trump and Sanders have in common. If you believe that this was the main reason the Midwest voted for Trump, it seems logical to believe that Sanders might have neutralized this advantage. This sounds good, but I don’t buy it. The whole point of the charisma theory is that people don’t vote based solely on logic. Trump had tapped into a deep well of cultural anger, and running a socialist Democrat who happened to agree on one issue was not going to overcome that. You could argue that Senator Sanders might have turned out the youth vote a bit better than Clinton did, but he might as easily alienate moderate Democrats. I am not saying Sanders definitely would not have won, but he also wouldn’t have been a sure bet to win, either. A Trump vs. Sanders matchup would have probably been about as close as Trump vs. Clinton and come down to who had luck on their side. And Trump would also hold a charisma advantage over Sanders, so he probably could have applied the same strategy. The real problem for Democrats doesn’t lie in who they selected for the top of the ticket. Nor is their problem demographical–after all, Clinton won the popular vote. No, the problem for the Democrats is geographical. “Swept the vast majority of the country’s land mass”? What the hell does that mean? Rocks can’t vote. It makes sense to have the Electoral College mechanism to ensure the most densely-populated states won’t completely dominate the rest, but that does not change how the majority of the electorate voted. As I discussed in detail here, the Democrats could have won the election without gaining even one additional vote, but simply by moving the votes they did get from California to swing states. The Democrats’ fundamental problem, far more significant than anything Clinton said or did, is that many of their voters are heavily concentrated in a few massive urban areas where their votes essentially don’t count. Republicans love to mock “coastal elites”–especially celebrities in the entertainment industry–for being out of touch with what they describe as the “Real America”. If the liberals on the coast want to start winning elections again, they ought to spread out from Los Angeles and New York and move in to central and Midwestern states. They don’t actually need to get “in touch” with rural Republican voters, because there are plenty of heavily Democratic urban areas even in the red states. They just don’t have the population they need to beat out the rural nationalist vote. And there is nothing about being in a rural state that automatically makes you a nationalist Republican. I should know; I grew up in rural Ohio, the heart of Trump country. There is not anything preventing Democrats from fanning out across the nation and establishing new strongholds. Most of the post-election soul-searching the Democrats have done has focused on topics like how to win over working-class whites, how to make the grassroots voters feel more engaged in the primaries, and so on. In my opinion, this is pointless hand-wringing that obscures the single most important point from the 2016 election: that Democrats have the votes, they just aren’t in the right places. Next Post: Last night was the best thing that could have ever happened for the Oscars.